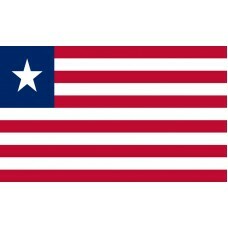 The Liberia Flag consists of stripes and a star and closely resembles the flag of the USA. It features the colors red, white, and blue. There are 11 red and white stripes and in the top left-hand corner is a blue square with a white star in the middle of it. The 11 stripes represent the 11 signatories of the Liberian independence. The red and white colors are symbolic of the courage and high morals. The blue square represents the continent of Africa and the white star symbolizes the first independent republic of Africa. 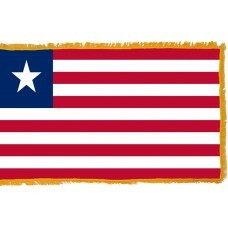 The Liberia flag was adopted on July 26th, 1847, when the country declared its independence. Liberia is a country located in Western Africa and shares borders with Sierra Leone, Guinea, The Ivory Coast, and the Atlantic Ocean. Liberia, which translates as "Land of the Free" was founded in 1822 when the American Colonization began to send freed black slaves there to establish a colony. The first settlement in Libera was built by 86 immigrants in the city of Christianopolis. Over 13,000 black people were sent to Liberia and were identified as Americo-Liberians. The Americo-Liberians are people who are very proud of their American heritage. The first President of Liberia was a man named, Joseph Jenkins Roberts, who was also a freed slave. Liberia is the only country in Africa that is home to native Africans but was actually founded by the USA. It is also the only country that had self-proclaimed independence and was not involved in a war to gain it and is only the second black republic in the world, following Haiti. The capital city of Liberia is Monrovia, which is also known to be the wettest capital in the world. Monrovia was formerly known as Christianopolis but the name changed and the capital city was named after the American president, James Monroe. The Liberian economy is mainly dependent on rubber processing (Liberia is home to the largest rubber plantation), palm oil processing, diamonds, and timber. Liberia is quite a poor country and is not a popular tourist destination. If tourists do visit, there are a collection of hotels in the capital city of Monrovia that look very run down. Liberia is home to West Africa's biggest primary rainforest (it was the first African country to agree to stop deforestation) but is home to only one national park, the "Sapo National Park". This park is home to varied wildlife, including over 200 species of birds and the endangered species - the pygmy hippopotamus. The beaches in Liberia, as well as being beautiful are quite popular with surfers, especially Silver Beach, but anyone that chooses to go and surf there must be a strong swimmer to be able to contend with the aggressive current.